King of Castile and Leon; son of Alfonso IX., King of Leon, and the pious Berenguela; born 1200; ascended the throne 1217; died 1252. 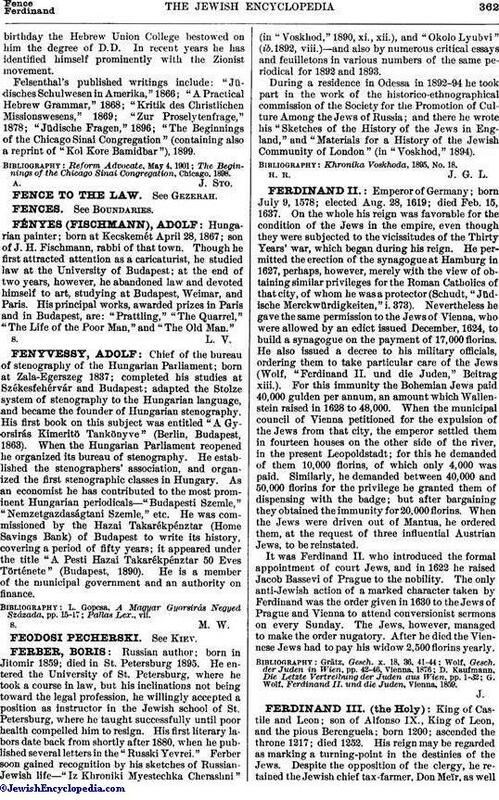 His reign may be regarded as marking a turning-point in the destinies of the Jews. Despite the opposition of the clergy, he retained the Jewish chief tax-farmer, Don Meïr, as wellas all the other Jewish tax-farmers, and sanctioned the "Concordia" which Archbishop Rodrigo of Toledo made with the Jews of his diocese. Ferdinand was the conqueror of Cordova, the old seat of the califs. In recognition of the services rendered by Jews during his expeditions he confirmed their privileges in several cities. Although he was not very favorably inclined toward Jews, they shared in the distribution of land after the capture of Seville. Aznalfarache, Aznalcazar, and Paterna, for a long time called "Aldeas de los Judios," were almost entirely turned over to them. Don Meïr received Valencia del Rio, several thousand feet of olive gardens, and 1,414 acres of land. The tax farmer Maestre Zag; his sons Moses, Zag, and Abraham; his brother Salomon; the king's physician Joseph Abraham ha-Kohen, and his son Joseph; the interpreter, or physician, Samuel of Fez; an interpreter of Talavera; and an unknown rabbi received in Paterna 40,000 feet of olive-and fig-gardens and many farms in Aznalcazar. The kings also granted Jews lands in Leirena, or Valfermoso, Galichena, Valencina-Toston, Treya, and La Algaba. 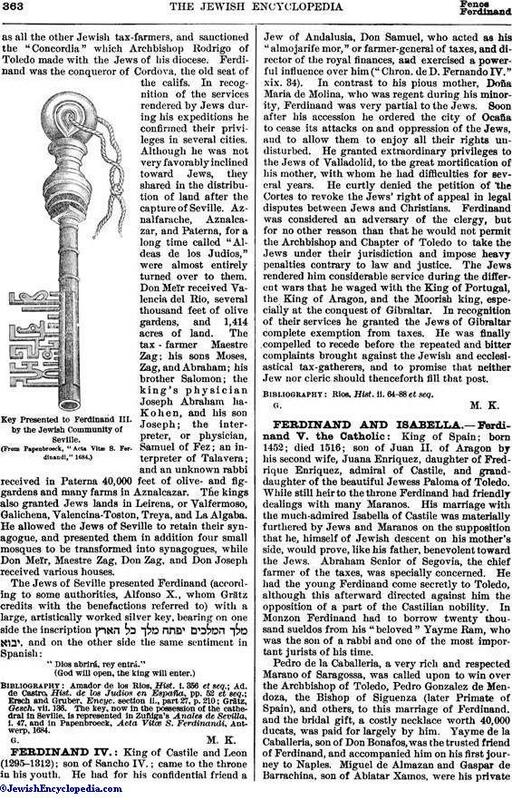 He allowed the Jews of Seville to retain their synagogue, and presented them in addition four small mosques to be transformed into synagogues, while Don Meïr, Maestre Zag, Don Zag, and Don Joseph received various houses. Key Presented to Ferdinand III. by the Jewish Community of Seville. Grätz, Gesch. vii. 136. The key, now in the possession of the cathedral in Seville, is represented in Zuñiga's Anales de Sevilla, i. 47, and in Papenbroeck, Acta Vitœ; S. Ferdinandi, Antwerp, 1684.